Pride House Glasgow Shortlisted for Award | LEAP Sports Scotland Pride House Glasgow 2014 nominated for Scottish LGBTI award! "> Pride House Glasgow 2014 nominated for Scottish LGBTI award! The Pride House Glasgow 2014 team are thrilled that Pride House has been nominated and now shortlisted in the first ever Scottish LGBTI awards. Congratulations to all those shortlisted across all categories of the awards. You can find out more here. We’d love you to help out by voting for Pride House Glasgow in the Sports Award Category. Pride House Glasgow was a safe and welcoming space created for LGBTI people and their allies to come and enjoy the Commonwealth Games in 2014. There were sports, cultural, political, celebratory, community, youth and family programmes to take part in. 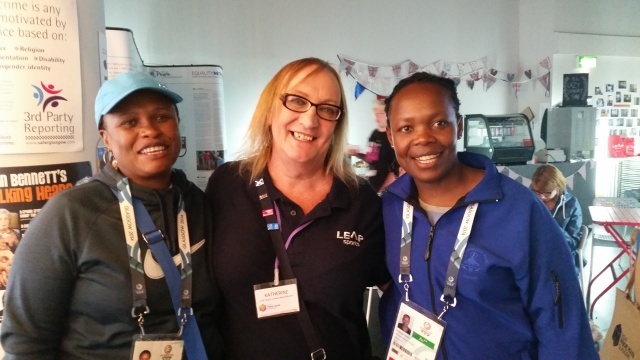 6,000 people visited Pride House during the Commonwealth Games in Glasgow. People from at least 39 different countries and territories visited Pride House. 90 different events took place over 12 days. 54 volunteers made up the core Pride House Team. 68 different sports and community groups, and organisations were project partners. First Minister Alex Salmond with some of the Pride House Team and some of our sponsors, July 2014. Since the Games, the team have been working with community activists in Brazil (Rio 2016), Tokyo (Japan 2020), Korea (Seoul 2018) and more to help create Pride Houses at future games, and putting Scotland on the map. As well as Pride House Glasgow, we are delighted to see that LEAP Sports Scotland Board member, and renowned campaigner and activist Katherine Burrows, has been shortlisted for the Outstanding Campaigner Award, which is a testament to her hard work and dedication. Well done Katherine. Written on 2nd August 2015.